Is your agency a B2C or B2B marketing Top Shop? PROMO’s Top Shops is a compendium of the promotional marketing industry’s best agencies. New for 2014, Chief Marketer’s B2B Top Shops listing spotlights the brightest lights in B2B Marketing. These listings are an editorial feature and there is no charge to be considered for or included in Top Shops. If you’re a promotional agency, click here for more information on how to download an application for PROMO’s Top Shops. 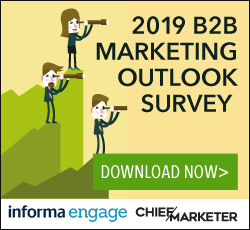 If you’re a B2B agency, click here for more information on how to download an application for Chief Marketer’s B2B Top Shops.